Save time calculating and designing O-Ring grooves and verify the O-Ring sealing performance by checking parameters like O-Ring compression, free groove volume, O-Ring inner diameter stretch and much more. for axial seals with inner or outer pressure, piston seals and rod seal applications. 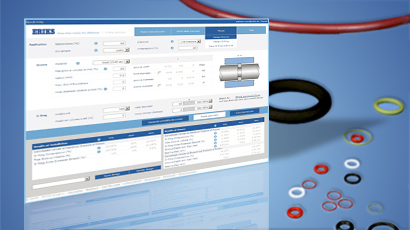 Worldwide unique online calculation tool taking into consideration of the thermal expansion of the construction parts and the O-Ring. As well as the chemical volume swell or shrinkage of the O-Ring. Choose between more than 30 construction part materials and 11 O-Ring compounds! Where necessary, a rubber prototype can be made as ‘fit and feel’ sample. Production of very small to very large series of rubber mouldings as O-rings is possible. Requirements for specific market segments are no obstacle for ERIKS.